The story of Stark Drive has been a tumultuous one fraught with anfractuous events that were prodigiously unexpected and required consummate all encompassing desire to achieve our goal of launching the most affordable and fully equipped electric bike in the world. It was November 2016 when we originally launched on Kickstarter. Due to our altruistic and countrified view to our first launch we had originally anticipated that we would immediately make headlines and virally spread through the interweb about a company offering a fully featured electric bike for less than the cost of most standard non-electric bikes. After launching we worked especially hard to contact journalists, blogs, and media providers to help us to spread the word about Stark Drive with little success. The unfortunate truth is that its normally only after a product is successful that these outlets become interested in reporting on new and exciting products. Here is where the story takes an interesting turn: Ilan Cohen and Alana Jesse from Indiegogo contacted us about 10 days into our campaign on Kickstarter and began discussions with us on ditching Kickstarter and instead launching on their platform. They were very excited about Stark Drive as at this point a similar product (Mate) had already been ultra-successful on their platform and they were looking for the next big thing which could earn them their commissions. We were roused with this apparently magnanimous offer where unlike Kickstarter they promised along with our launching on their platform that they would dedicate campaign managers to our team and guide us at every step in order to ensure success. 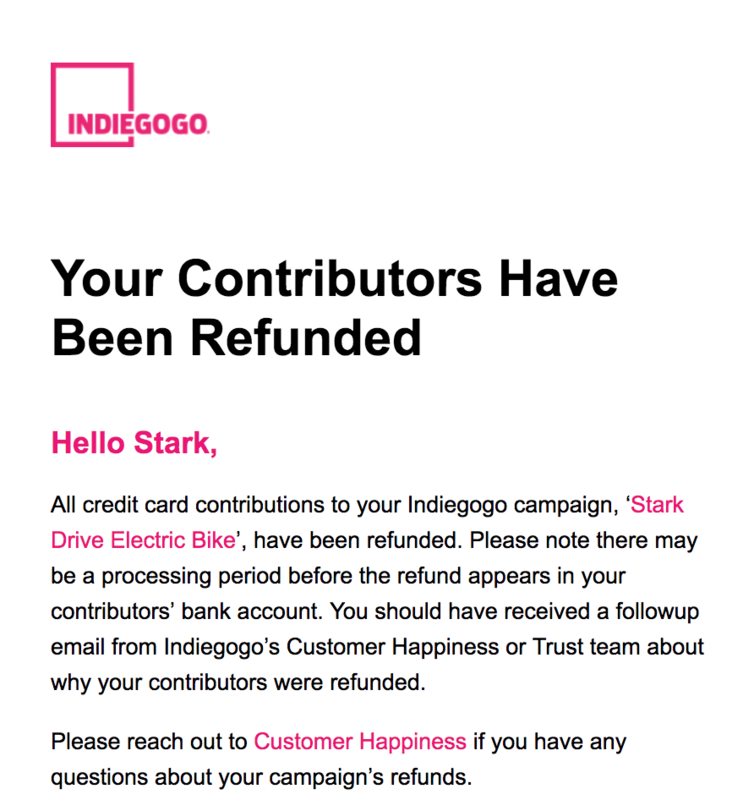 We thought that this was just the boost we needed in order to make Stark Drive work and bring it to life so we accepted Indiegogo's offer and cancelled our project with the intention of following the step-by-step instructions that were then provided to us from Indiegogo in the form of guides with helpful hints such as setting up mailing lists, being more active on social media and basically spreading the seed of Stark Drive everywhere we could. They also encouraged us to write up our campaign on their site so that they could review, fine tune, and approve it. They also encouraged us to draw inspiration from other successful campaigns with similar products especially recent ones such as Mate. We vigilantly followed all of their instructions and were especially pleased when after reviewing our campaign text, they said that it was near perfect and that it was a major step forward to ensuring our success. We re-launched Stark Drive on February 15th 2017 to much fanfare and success with us achieving our initial funding goal in less then 10 hours. Our support team was overwhelmed with the amount of success and sheer number of people contacting us with questions, words of encouragement, and most importantly contributions. Days passed with our campaign seemingly picking up more and more steam and with this success we finally started receiving some media attention with journalists now interested in writing about Stark Drive. This in turn drove more traffic to our campaign and so the cycle continued. However as we were seemingly gaining more and more ground with our campaign, Mate had a problem and conspired with their legal team, specifically Simon Kristoffersen (rocketadvisory.com) in order to try to find a 'solution' to the problem of Stark Drive. I have to give credit where credit was due in terms of the creative method they used approximately a week later on February 23rd (after rocket advisory emailed us and began asking questions unrelated to our campaign) their lawyer sent a DMCA request to Indiegogo fraudulently stating that Stark Drive was copy of Mate (A bike style that has been sold since 2011 and can be purchased on nearly every street corner in China). The unfortunate thing about DMCA notices are that in nearly all cases the website receiving the complaint does no investigation if the complaint is legitimate or not in so much as they become complicate and potentially financially liable if they do not immediately take down the content immediately according to the regulations that are behind the DMCA process. However, although the original DMCA complaint was fraudulent, Indiegogo is not without fault with respect to the events as for some reason they decided not to follow the proper DMCA procedure both easily available online and on their own Terms and Conditions . After receiving such a notice they are within their rights to take down the infringing material however the next must be that this notice is sent to alleged infringer (in this case Stark Drive) so that they can reply with a counterclaim (under penalty of perjury) at which point the content must be restored and the complainant can then move forward to initiate legal proceedings if they truly are confident in their claims. In fact when our original campaign was taken down, we had no idea why because we received nothing except a notification that our campaign was going to be cancelled. We fruitlessly tried to contact Indiegogo by all means available to us: their non working phone number which is basically an answering machine, email, twitter, facebook and several of our backers also tried to contact them to inquire why our campaign was cancelled with a stock response provided that 'we were under investigation'. At that point, i decided to do something a little brazen and booked a flight to New York to visit the offices of Indiegogo personally to inquire about Indiegogo's procedures, their trust and safety team and how a campaign is supposed to run. Having arrived to their offices, i simply asked if i could talk about launching a new campaign and speak to someone there about that. During the meeting and after seeing what we were interested in launching, the representative Frederico Ribeiro immediately mentioned the Mate campaign as one that we should mirror as closely as possible as they had achieved so much success. More interestingly when i revealed that this bike was a commonly available model that has been available for years in china he stated that its against Indiegogo's terms and conditions to simply resell a product. Ironically, after our campaign was taken down, a new one showed up which is the exact same as Stark Drive albeit that its 5x the price of ours! Or this bike which is only 2.5x the price of Stark Drive I guess Mate has no problem with them because they dont compete with their pricing model nor do they seem to be getting much traction in their campaign. Upon returning home to Sweden pigs must have learned to fly because we finally heard from Indiegogo, well not exactly Indiegogo but their lawyers whom finally responded to a letter that our lawyer had sent to them when our campaign was cancelled over a month ago. In it they stated a lot of interesting information about why the campaign was cancelled as well as banning me from visiting any of their offices in the future. Of course we had received none of the funding we had so diligently raised so we up the preverbal creek without a paddle and at this point didn’t know what to do or how to proceed but nothing worth doing is every easy and our passion to get Stark Drive to market overruled ever giving up on finding a solution and a way forward. Exploring our options we temporarily considered trycelery.com which is a crowdfunding platform that one runs from their own website and we eventually settled on crowdfunding our launch through our own website and set out to inform all of our original backers, or at least those that had registered through our website. it took us an additional couple of months but after our website was redesigned we launched again in April. The launch was successful and we did achieve enough to bring Stark Drive to market however unlike some of our competitors we actually will be making the first delivery of Stark Drive to our early backers days after our campaign ends. We hope that these early supporters will be our ambassadors and this will help to generate even more traffic to our site and that sales will skyrocket at that point. In regards to the fraudulent DMCA, well this story is unfortunately just beginning and we are expecting the process to take years to resolve if the responsible party does not settle with us as any responsible, serious company would do when they are so clearly at fault. We want to thank everyone that believed enough in Stark Drive to support us and help to make it a reality. Our companies benevolent maxim is simply this: To enable everyone to have the opportunity to be able to own an electric bike with price no longer being a factor in the decision making process. We believe that in the near future all bikes will be electric just as we believe that in the future all vehicles will be electric.